This tutorial will explain how to create RSS feeds for Facebook, Twitter, YouTube, Instagram, etc. These are some of the websites which don’t support RSS at all or provide RSS feeds but are quite difficult to find. So, the method explained in this tutorial will help you overcome these problems and easily create an RSS feed for such websites. It can be done using a free web service called “RSS Box”. It supports various website and lets you generate the RSS for a specific profile, channel, etc. For that, all you would need to do is enter the profile URL, channel URL, or username and then it will automatically generate the RSS feeds. It also provides some additional options for specific websites to choose what you want to include or exclude from the feeds. Once you’re done creating an RSS feed, you can use any of the free online RSS readers or RSS reader software to see and read the content. Twitter, YouTube, Google+, Vimeo, Instagram, Periscope, Soundcloud, Mixcloud, Twitch, Speedrun, Ustream, Daily Motion, Imgur, and SVT Play. If you think that the supported websites are not enough then do not worry as this service is open source. That means you can easily get the source code and tweak it as you desire. With each website, you will also see an associated input field, as shown below. Now, to create an RSS feed for any of these supported websites, all you gotta do is enter the username, channel name, source URL, etc. For example, if you want to create an RSS feed for Twitter, then you would need to either enter the Twitter handle or a URL in the input field. After that, click on the down-down menu on the right of the input field. Then you can choose various parameters which you want to include or exclude from the RSS feed. Once done, all you gotta do is click on the “Get RSS Feed” button. As soon as you do that, it will automatically process the Twitter handle or URL and create an RSS feed for that particular handle. 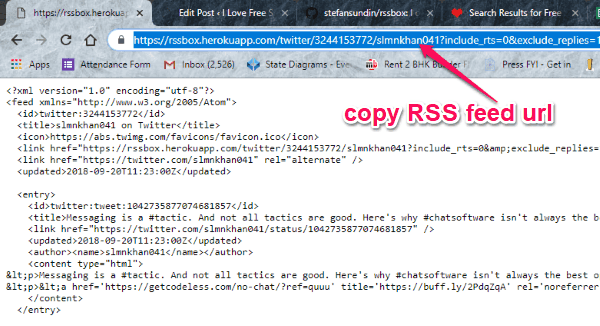 The RSS feed will open up on a new window on your browser and you can simply copy the URL from the address bar to read the feed with an RSS reader. RSS Box provides one of the best solutions for you to create RSS feeds for some of the websites that don’t support RSS. The main USP of this service is that it is completely free to use for creating as many RSS feeds as you want for different websites like Twitter, YouTube, etc. 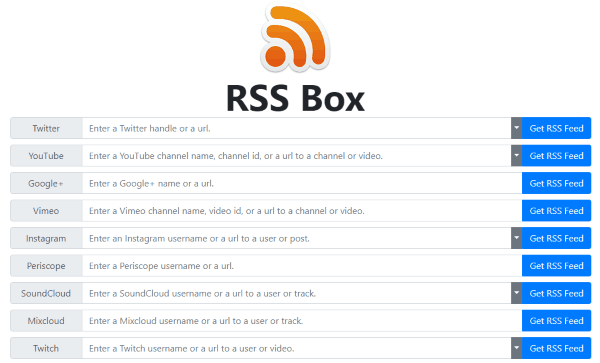 So, if you have been looking for something like that, then you must try RSS Box. 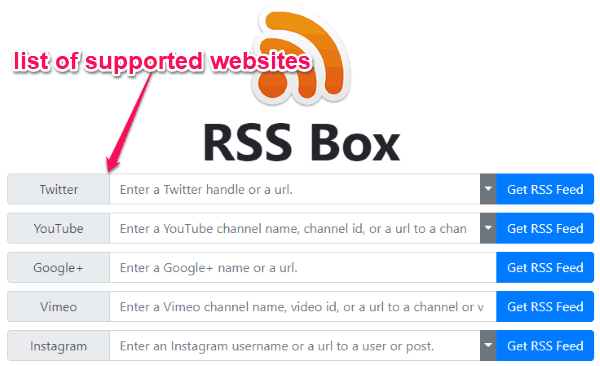 Try “RSS Box” from here.